We recently celebrated Mother’s Day in the U.S., but demographics tell us that mothers make up a smaller percentage of the population than at any time in at least the last quarter century. 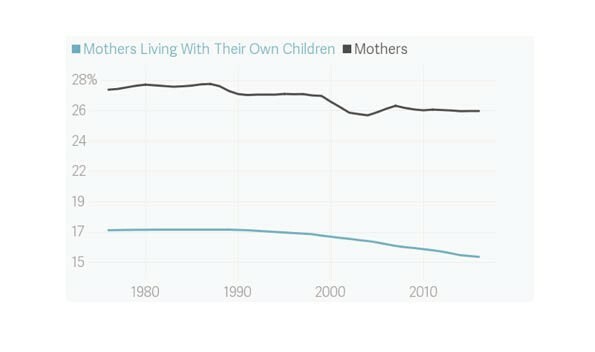 Today, only about 26% of Americans are women who currently have or have had children, and only 15% of Americans are mothers living with their own children. (See graph). According to the U.S. Census Bureau, mothers today tend to be older than in the past; where once the peak childbearing age for American Women was 25-29 years old, today the peak is in the 30-34 age range. Childbearing among women under 20 has fallen by half or more in the last half-century, as increasingly-educated women delay marriage and make effective use of contraception. Meanwhile, the biological potential for older women to have children is improving thanks to a panoply of fertility-enhancing medications. Of course, that doesn’t mean that mothers are in danger of becoming a vanishing breed. But perhaps when Mother’s Day rolls around again, we can add to the holiday, and appreciate all women who contribute meaningfully to our lives.